Goal Keeping is a very specialised position with top quality coaching lacking at many clubs and schools. Many players come into the game with little training or coaching and therefore can pick up bad habits that stop them reaching their full potential. Go For Sport offers a variety of GK coaching sessions with our Head Coach; Double Olympian and South African Number 1 GK Mariette Rix. Mariette has years of International playing experience and has also been coached herself by some of the best GK coaches in the world, including Dutch GK coach Martijn Drijver. 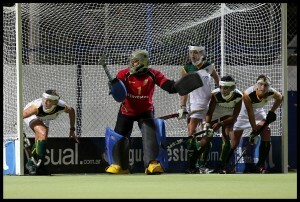 She also wrote the GK manual for the South African Hockey Association Coaching Course. We can provide 1 on 1 coaching or in small groups. Please contact us for more information and a quote. Please contact us if you would like to book a session or about coming into your club/school and running a session. We try and be as flexible as possible and will be happy to see if we can help match your requirements.